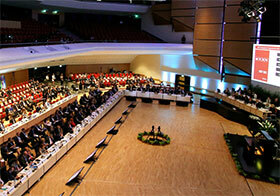 The 67th session of the WHO Regional Committee holds its final session. This year’s participation of high-level political figures, including 2 prime ministers – Hungarian Prime Minister Viktor Orbán and Greek Prime Minister Alexis Tsipras – indicates a strong political commitment to achieving health goals in the WHO European Region. In her opening address on Day 1 of RC67, the Regional Director repeatedly referred to the imperative to “leave no one behind” as one of the key drivers for setting priorities and commitments. Leaving no one behind is at the heart of the 2030 Agenda for Sustainable Development. Later at RC67, Dr Jakab introduced a roadmap for implementing the 2030 Agenda. Building on Health 2020, it brings the Region’s priorities forward and provides a common direction, highlighting actions that can accelerate and strengthen the capacities of Member States to achieve the Sustainable Development Goals. Member States widely supported the roadmap, and adopted the related resolution. This is how Dr Hans Kluge, Director of the Division of Health Systems and Public Health, described the health workforce during his presentation at RC67. The recognition that effective care and improved health can only be achieved through a sustainable workforce led to the development and adoption of a framework for action for health workforce sustainability. implementing the Declaration of the 6th Ministerial Conference on Environment and Health. This year, 6 short films featuring individuals who have personal experiences of and insights into topics discussed at RC67 – the “Voices of the Region” – introduced key agenda items. The 68th session of the WHO Regional Committee for Europe will take place on 17–20 September 2018 in Rome, Italy.